Object : System for the data processing control of a float of vehicles. reduction of the maintenance costs, through a detailed analysis of the work made (by vehicle, by line, by type of car, ...). It is the dialog tool between the driver and the on-board various equipments and, among them, the maintenance aiding system. 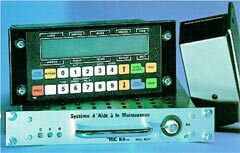 Linked to the equipments of the system itself by a RS485 link with 4800 bauds transmission bus. The console is the master equipment, it questions the other equipments considered as "slaves". Each slave equipment is able to control the display, the keyboard, the light and the buzzer of the console, under its control. * a front face equipped with a LCD retrolighted display of 2 lines of 20 tactile keys, of the 1/4 turn locking system and a supple serigraphic keyboard. * a back box receiving the electronic cards (mother card, CPU card, power supply card, optional card with 8 digital inputs/outputs. It records the information delivered by the sensors which are linked to it, such as the defaults declared by the driver on the interface console. The information is then delivered to the ground equipment through the infrared transceiver and to a maintenance portable PC that provides also the box programming. * at the back : 2 thirty-pin connectors (one for 24V power supply, transmission bus, vehicle\'s identification, and one for the 12 digital sensors and 2 impulse sensors, the travellers\' counting and the infrared transceiver plugging). the electrical components are grouped together on a mother card with a 80C31 microcontroller. * 5 points (I/O, +, - / earth) for the infrared transceiver. The infrared transceivers permit the wireless communication between the vehicle and the ground. The infrared transceivers used in the vehicle and on the ground are the same. Infrared transceivers mounted in the vehicle are placed near the side window. The ground infrared transceiver is mounted on a portico on the roadside. the infrared transceiver is a plastic box with an optical window at 45° and includes a CMS mother card, an infrared I/O head and a five pin connector. The operation voltage is from 18 to 32 V. Protection against polarity reversals and industrial and HF interferences. Serial link by current loop with bidirectional half-duplex transmission - Data format is transparent and the transfert speed is 9600 bauds. * 1 power supply for the various cards and the ground infrared transceivers. * 1 RS422 for the link with the central data processing unit. We conceive the whole on-board equipment in the system (interface driver/system console, technical box, infrared transceivers, cabinet and ground interface).